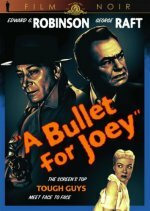 A disappointing reunion of Edward G Robinson and George Raft, this economically-made crime melodrama revolves about a communist spy's use of an exiled gangster to kidnap an atomic scientist. Raft plays the gangster, while Robinson is the police inspector who uncovers the scheme. The two stars' climactic encounter on a boat takes far too long to materialise and feebly suggests that even mobsters are patriots when it comes to the Red menace. Audrey Totter and Peter Van Eyck deliver sharp performances as the moll who seduces the scientist and the master spy respectively.